Drawings from our U.S. patent. and the other in compression. Of course there are many engineering details that combine to enable an actual running machine. 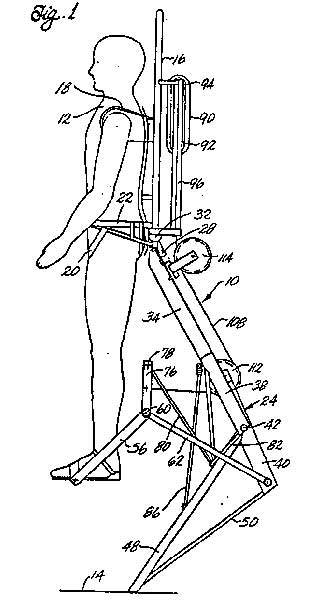 However, the heart of the SpringWalker™ technology, described in U.S. patent 5,016,869, combines two ideas for the first time: Leg force is increased and body weight distributed by means of a leveraged exoskeleton; a single spring is coupled to both legs. 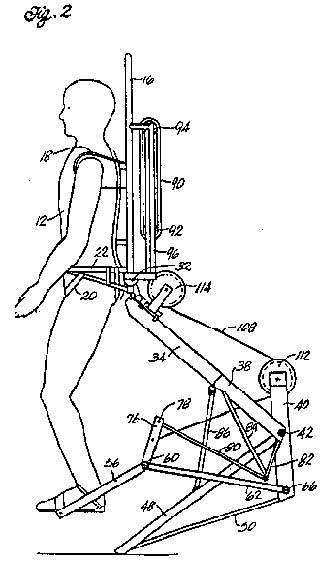 This prevents foot-dragging and enables a natural gait for the user. A computer-designed linkage combines these elements to give the first true running gaits in a spring powered body amplifier. It also provides an ideal match to the capabilities of electric servo-motors. Watch this site in the coming months for news of progress in the servo-powered development.